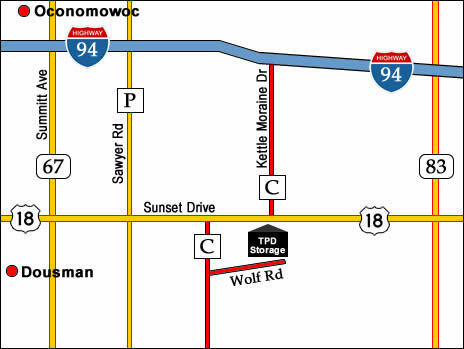 Oconomowoc's TPD Storage Facility offers many storage tips below on how to take care of your stored items and how to get the most out of your storage space. ➤ To prevent condensation damage, place your items on wooden pallets or boards. ➤ Leave a small airspace between your items and the wall for ventilation. ➤ Cover wooden furniture with blankets to avoid scratching. 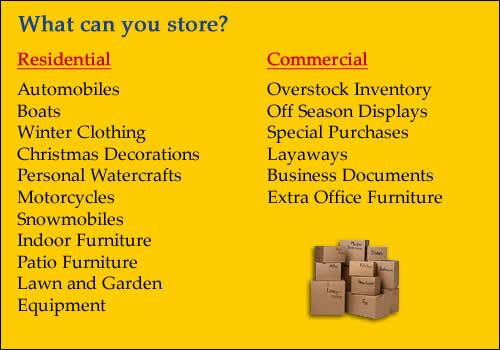 ➤ Store more frequently used items in the front of the unit. Cars & Trucks: Apply a coat of wax to the exterior painted surfaces and make sure gas tank is full - use an additive such as "Sta-Bil." Boats: Check for worn or loose parts, check propeller, and fill fuel tank. Outboard Motors: Disconnect fuel line and run until motor stops (make sure that there is water cooling the engine). Store outboards in the upright position. Inboard Motors: Flush the cooling system, remove plugs and drain all water from the engine, change oil filter and refill.